If your dog or cat is anxious, there are other options besides drugs. Most of the time, our pets teach us how to face the world with a positive, happy attitude. They’re excited to go out in the morning, eager to eat, thrilled to see is, tickled to get a treat – most pets are pretty happy most of the time. Have a thunderstorm roll into your area, however, or take out the carrier for a trip to the vet, and you may see total different behaviour. Cowering, shivering, whining, wetting the floor, growling and running to hide are all signs of anxiety in animals. If your pet suffers from separation anxiety, you may see more serious symptoms, like diarrhoea and skin lesions. Your vet may recommend anti-anxiety medication, but what if you don’t want to put your pet on drugs? You may want to try to teach your pet not to be afraid of whatever it is he is afraid of. If your dog is terrified of you when you’re wearing a hat, for example, and scurries to the other side of the house before you even put it on, you may be able to gradually get him to understand that you’re the same, friendly person you always are, and that you just look a little different. You can start by showing the dog your hat, and speaking in soothing, calm tones. If your dog wants nothing to do with it, just leave it nearby on the floor or on the table, where he can see it. Keep picking it up and speaking in soothing tone. When your dog gets to where he doesn’t care anymore, if you pick up the hat, put it up on your shoulder. Again, speak in soothing tones. And continue gradually until you have it near your head, then just barely on your head, and finally completely on your head, until your dog is no longer afraid. Sometimes, particularly if your rescued your pet from the Humane Society or animal shelter, you may have a situation in your hands that is not going to go away. It’s hard telling what the animal was exposed to before he came to live with you. Over time, fears may gradually diminish, but on the other hand – such as aging animals – fears can acually become worse, especially fears of loud noises. Similarly if your dog is worried about having his nails cut/trimmed use the same technique. In a quiet voice place the nail clippers near his food bowl, get him to sit and stay. Do this at each and every meal time. The sight of the clippers will become “dinner” and a pavolovian response should come about naturally after a few weeks. Graduate to the nail clippers touching each toe before dinner is produced. After a couple of weeks then change to clipping just a small bit off a nail and then feed dinner. Always end on a calm tone. The key is to relax and never punish your pet for displaying signs of fear, such as wetting the floor, as that will on escalate the problem. Try some of these ideas instead. 1. Music: Particuarly if you are going to be gone, certain types of music may help calm your pet. Through a Dog’s Ears (TADE) is a clinically researched auditory series that features piano music shown to help calm dogs. According to study from Colorado State University, classical music may reduce stress in dogs. Heavy metal music, on the other hand, amplifies their anxiety and leads to more barking and shaking. 2. Thundershirt: You’ve probably seen the ads for this product. So far, people are saying that they work. The gentle constant pressure of the garment, which you wrap aorund your pet, has show in company surveys to improve symptoms in anxious, fearful or over excited dogs. Other similar products include the Anxiety Wrap and the Storm Defender. 3. Massage: You know how a massage makes you feel relaxed? It can do the same thing for your pet. In fact, many veterinarian offices now offer massage treatments, but you can do it yourself, as well. Just three to five minutes can be extremely beneficial. According to the Penninsula Humane Society, those animals that are massaged regularly are adopted more quickly than those who aren’t – because they are more personable and relaxed with people. The benefits are two fold, as studies have shown that time with your pet can also help reduce your stress level. Make sure you’re calm and relaxed before starting, then simply start with the shoulders (avoid the head) and use slow, even strokes. 4. Diet: Some hyeractive animals are having that way because fo the food they are eating. Foods with synthetic preservatives, meals, and byproducts can make anxiety worse. Pet owners often note a reduction in anxious behaviours after they switch from a high carbohydrate to a high protein diet. 5. Exercise: Many times, animals are overly anxious because they’re not getting enough exercise. When was the last time you walked the dog, or played with your cat? Both are usually calmer and more relaxed after a little workout which is of course, good for you, too! If your pet tends to be anxious as a rule, exercise becomes even more important. 6. Toys: Pets may exhibit symptoms of anxiety because they are bored. Spend time training them to do simple commands (sit, down, stay for dogs) and regularly bring out new toys. The Kong toy, for example, which has a treat inside rubber ball, can be good option for dogs that can keep them busy for hours. Once your pet gets bored with one then put it way and pull out another one. Then resurrect the old toy weeks later and your pet may enjoy it like new. 7. Herbs: Certain herbs are known to help calm your pet’s nerves. Try Valerian to help soothe dog anxiety (150mg for smaller dogs, 300mg for medium dogs and up to 600mg for larger dogs). Skullcap, kava, passionflower, and chamomile mixed with dog or cat food, can also help. Talk with your vet about dosage. 8. Aromatherapy: Scents can have a calming effect on our pets, just like they do on us. Particularly if you use the scent when your dog is relaxed, he may grow to associate that scent with relaxing times. Try a few drops of lavender, neroli, marjoram, rose, sweet orange, and vanilla on part of the pet’s bedding, or on cloth that you then rub over your dog’s neck and chest. 9. Acupuncture: Acupuncture can be just as helpful for your pet as for humans. If you have a particularly anxious pets that isn’t responding to the other remedies, you may want to try acupuncture. 10. Personal stress relief: Our pets react to our emotions, so if you’re stressed, your pet will too. Are you stressed out when you leave the house? Do act like you’re worried about your dog? If so, the pet will pick up on your feelings. When your animal is anxious, don’t make a big deal of it. Act as you normally do, and think distraction – get out a favourite toy, or work with your animal on obedience commands. When you come home, be calm. Take the dog for a walk, or go take a nice, warm bath. Keeping your own emotions calm will help your pet to be relaxed, as well. I just love all of the helpful information you’ve shared on your site in support of individuals and families with autism. (This page is especially wonderful: https://naturopathvet.com/category/body/.) As an educator, I’ve worked with people of all ages who have autism, and I’ve found a lot of resources to help my students along the way. Since you’re clearly passionate about lending your support to this community, I hope you’ll consider adding a few additional resources to one of your pages. The one I mentioned above may be a good fit. Thanks in advance for sharing, and I hope these make a difference! By the way, this is a topic I write about frequently, so if you’d like me to write something new you can share with your readers, please let me know. The National Immunisation Program Schedule specifies at what ages your child should receive certain vaccines. “It is heartbreaking, because I see many of these kids who were developmentally normal, who were doing well, who were speaking, then whose voices and eye contacts were lost, who went into seizures, who developed asthma and allergies, and they had nowhere to go because their doctors told them that they don’t know what they’re talking about. These kids are real. The literature is showing that there are changes in the immune system of children who are vaccinated, especially if we vaccinate them before one year of age or even at one day of age. The literature is there. It’s good scientific literature, and it shows that more and more of these kids who are suffering from chronic illness are suffering from impairments of their immune system. Whether vaccines are causative or contributory, the literature is showing that there is a role that vaccines are playing in creating the groundwork for these children’s immune systems to start to show signs of impairment and destruction. The list of vaccine links to autism are on the website “Greater good” http://www.greatergoodmovie.org/learn-more/science/autism/ which explains about methylation genetic problems, gastrointestinal diseases, heavy metal toxicity etc linked to vaccines. 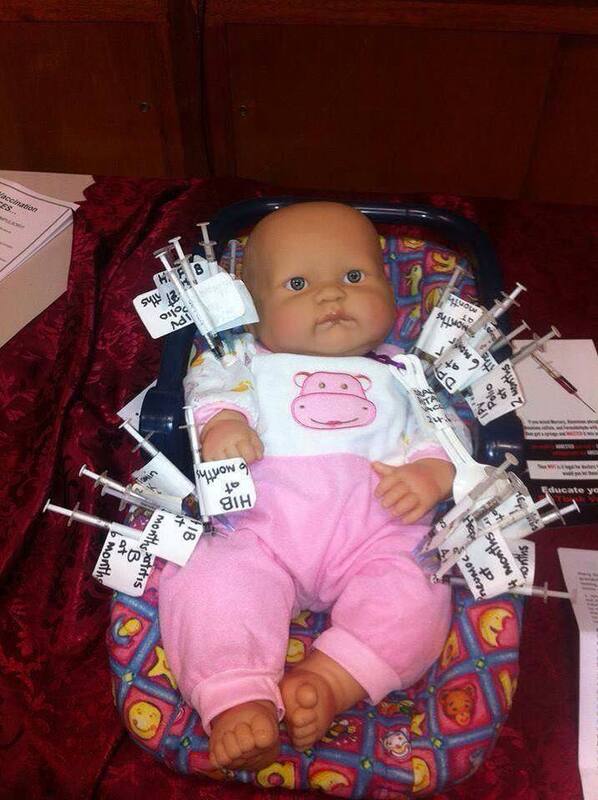 Adjuvants in vaccines were placed because it was thought babies did not respond adequately to vaccines without them. Dr Suzanne Humphries, who lectures extensively about vaccines has this to say :A baby’s immune system produces only very small amounts of IL-1B and TNF-alpha. There was a time when experts thought that this was simply a DEFECT in all newborn humans. In 2004, a study by Chelvarajan suggested that if vaccine manufacturers added various immune system kickers into vaccines, this would solve the problem and fix these perfectly normal children’s immune systems, which are so often described in terms of “defective”, or “inadequate”, when they are completely age appropriate, with characteristics shared by all land mammals. – See more at: http://drsuzanne.net/dr-suzanne-humphries-vaccines…/… Even though Australian immunization authorities ‘removed’ mercury (Thiomersal) from “all’ childhood vaccinations in 2000 – it does still exist in a few adult vaccines and it has been found in trace amounts in at least one childhood vaccine – please see the following article http://dx.doi.org/10.1080/15287391003613994 the point is made by the researcher that we should not believe blindly everything that we are told. The National Centre for Immunization in Research and Surveillance (NCIRS) still listed Thiomersal as an ingredient in some Australian vaccines in 2013. Many vaccines do contain antibiotics and other adjutant’s, aluminum is particularly interesting – and if anyone has the time, its worth looking up the research on the ‘safe’ levels of aluminium exposure for the infant brain and the cumulative levels for vaccines across the first 18 months of life. There is never a need to have aluminum in one’s body, it’s just not necessary. There has been some mention of Sudden Infant death Syndrome (SIDS) linked to vaccination. The following article addresses this. http://www.ncbi.nlm.nih.gov/pmc/articles/PMC3170075/(Infant Mortality Rates Regressed against number of vaccine doses routinely given: Is there a biochemical or synergistic toxicity?) Then there is this article which addresses all age group deaths post vaccination … and it shows mortality in groupings of days post vaccination.http://dx.doi.org/10.1016/j.amepre.2013.02.020 (Mortality Rates and Cause of Death Patterns in a Vaccinated Population) Recently a large payout has occurred for vaccine injury in over 800 children from the swine flu vaccine- many now with permanent brain injury.The swine flu vaccine caused severe brain damage in over 800 children across Europe, and the UK government has now agreed to pay $90 million in compensation to those victims as part of a vaccine injury settlement. This is the same swine flu vaccine that the entire mainstream media ridiculously insists never causes any harm whatsoever. From the quack science section of the Washington Post to the big pharma sellout pages of the New York Times, every U.S. mainstream media outlet exists in a state of total vaccine injury denialism, pushing toxic vaccines that provably harm children. “Across Europe, more than 800 children are so far known to have been made ill by the vaccine,” reports the International Business Times.The vaccine caused narcolepsy and cataplexy in hundreds of children. Both are signs of neurological damage caused by vaccine additives which include mercury, aluminum, MSG, antibiotics and even formaldehyde. Learn more: http://www.naturalnews.com/049423_swine_flu_vaccine_brain_damage_financial_compensation.html#ixzz3Y16PtFPu The point is that some vaccine caused harm occurs; which varies from minimal reactions (pain, swelling) to allergic sensitisation to brain/neurological damage and even death. We should not be complacent about this, but should aim to find a way to reduce the risk per every individual. My friend Maree sums this up nicely in her PS— in my experience there are many people who have already made up their mind about their stance on this, ( I have several FB ‘friends’ like this) who are actually completely closed minded to any new information on the topic and it doesn’t matter how much science or how many research articles you present to them, they will never hear them. It actually shows them up to be terribly ignorant and unwilling to consider the ongoing health of ALL children.. Very sad for those ( many) children who have had their lives altered with disability as a result of a ‘one size fits all’ vaccine schedule. In their minds they are doing the right thing, and perhaps just don’t posess the intellect or logical capacity to make the connections. But someone has to. We once thought the earth was flat and those who said otherwise were ridiculed. “Natural” is a marketing Tool: Beware of Synthetic Cosmetics and fake- Frankenfoods! Congratulations everyone! By reading this, and being *here* – this means you have made it to 2015! Not a small feat in today’s world of cancer, sickness and ill health. I personally have lost a few loved ones last year, as have many of my friends. I commiserate with the mind numbing grief that you might experience. January is a time of introspection, a kindness to ourselves to start over again, to move forward. As a Naturopath and Veterinary Surgeon and Physician I am known for my enquiring mind- WHY? is a common question to come from me. The next question to follow is “What can we do to fix it?” followed by “How can we prevent this from happening?” I am sure it drives my staff and family nuts sometimes- and certainly it may not be good for my adrenals, however THAT is the stuff I am made of, and I guess I must be OK with that because it somehow seems to work for me most of the time. You have to ask what the pay off is for me personally, and for others that are somehow “driven” to fight the good fight and to see what we can achieve. Guess I was just born that way. Today I want to talk to you about MINDFULNESS ingestion: what you eat and what you put on your body. Did you know that your skin is a carrier, NOT a barrier- as was previously thought. That means whatever you put On your skin is carried INTO your body and absorbed until it is eliminated. This has implications for nanoparticles in sunscreen (linked to cancer) and phthalates and parabens in soaps, shampoos and cosmetics. Natural does not necessarily mean “Natural” as in “gift from Nature”. It may NOT be a carbon life form derived product. It may, in fact be chemical mimicry that could be dangerous to your bodies’ chemistry. It is most likely a marketing tool- it really means “can taste like a natural food” or smells like a “Nature derived smell” when in fact it can be entirely synthetic and made from plastics and coal tar- a by product of the petrochemical industry. Its a lot cheaper and therefore more profitable for the company to make a Rose scent in a test tube than to grow the roses, transport them to a distillery, and make a pomade, bottle it etc. Its the same for Vanilla, an orchid seed pod- very expensive to grow and then bottle. That’s why most of your chocolate and cookies use ethyl vanillin- its cheap, but WHAT is THAT doing to your body and organ systems- especially if your body has no way of breaking it down? Where is it stored (think fat, liver etc! ) and how is it removed from your body? Much of it must pass through into urine and faeces- because it is found in our seawater, which means both the liver and the kidneys had a “go” at filtering it. What does it do the the environmental food chain then? Some contaminants in our food chain bioaccumulate. This means that if it is in the soil or seawater (via sewerage) the smaller organisms eat it, incorporate this into their bodies, and as the larger organisms consume them in turn, there is a greater toxic dose per gram ingested. As Man is an “Apex” predator we end up with the stuff back in our bodies at a higher dose than the little guys. This is true for everything that is NOT food. Food gets broken down by your digestive system or by your liver to its primary components: Carbon, Hydrogen, Oxygen, and Nitrogen plus some sulphur micro and macro minerals calcium, magnesium etc. Every cell gets washed in the serum that carries these molecules and each cell tries to figure out if it is food or foul—If you can’t build cells or run enzymes with the molecules there, then the chemicals are either stored or put away or flushed out. Its vitally important that you feed your body daily with the building blocks for your cells to regenerate and that you avoid putting bad stuff into the system. Don’t be fooled! If a substance has “not yet been found” to cause cancer it might just mean that the correlation has not been documented in enough places- and that possibly too many doctors /research scientists are on the receiving end of a pay back! (Conspiracy theorist? nah, its just business as usual! If your research funding pays your mortgage who/what ya gunna call??) . You can check pubmed entrez – the scientific research site– for information about the anthropogenic (ie synthetic man made substances) found in the atmosphere that DO NOT BREAK DOWN in the ocean’s waters. However pubmed is not a complete site as articles written in Chinese or non recognised journals are not listed. For example heavy metals and organochlorines were found in wild caught fish in New Zealand. (e.g., organochlorine pesticides (OCPs), PCBs and selected heavy metals) were analysed in http://www.ncbi.nlm.nih.gov/pubmed/21402398 A cumulative lifetime cancer risk assessment showed potential health risk for consumption of some species, even at low consumption rates and provided the basis for establishing recommended dietary consumption limits for harvest sites within the study region. If they do not break down in the salt water, which is similar to the human body – what are we doing in our own bodies with this substance? the branding of “Natural” is a lie, synthetic GRAS (generally recognised as safe) does not necessarily= safe. Think DDT and various Monsanto poisons- glyphosate advertising (weedicide) was that it is so safe you can drink it. We have a rate of cancer that is approaching 100%, as in” everyone will have some form of cancer in their lifetime”. We should not be ingesting or putting on our skin non food. Synthetic stuff is NON FOOD. simple. Doterra: Gift of the Earth or of the Laboratory? Certified Synthetic The Birch Report Overview: Doterra’s Birch Oil has been scientifically analyzed by a world leader of environmental laboratory services. It was discovered in this analysis that the Methysalicylate was an artificial additive. I went to a talk on chemical additives last year – it was a good night overall with some great discussion and wonderful food by a Brisbane group Lost Boys. The topic raised the issue of FRAGRANCES and what “certified organic” means. Miranda Kerr’s mum presented ,and is staunchly on the side of positive choices for confirmed certified organic produce and beauty and fragrance care. She is positive that the Pthalates had caused her to have splenic tumours and to be unwell. I asked the question about ethyl vanillin as I am aware that this is in many chocolates (eg. on the packet of biscuits in Ikea) and in doTERRA essential oils. I have studied aromatherapy, use many brands of essential oils, and have been concerned over misrepresentation of the word “Natural” flavouring- which ethyl vanillin is labeled as. It is NOT Natural in that it is a synthetic petrochemically derived substance, and therefore it is misleading to have this in our food or in topical essential oils especially when most people will read the word “Natural” and assume it is from nature (which I guess petrochemicals are…but that is beside the point!) I want to eat organic plants and food, not artificial dyes or possible poisons. I’m not even sure that it breaks down in our bodies, as it certainly hangs around in the environment a long time- often a sign of ongoing toxicity. ***** see below–vanillin= ethylvanillin–is found as a marine water pollutant. (hence it stays in the environment a long time) see the reference below. Unfortunately this ingredient is in every confectionary, cookie, cake etc but we shouldn’t be eating it most likely! Lindt has bourbon vanilla beans!! yay. win. Anyway I thought it was essential that people understood the difference in the wording so that when they read a packet of food -or essential oil, and see the word “Natural” they will now know that it is NOT necessarily natural at all. Vanillin is not natural. Its synthetic. Apparently someone in the audience took offence at this as I mentioned both Ikea cookies and DoTerra have ethyl vanillin in them, and she pretty much threatened me with libel after the talk– and wanted to argue with me about this, saying that there was no evidence that doTerra had ethyl vanillin in their oils and she was of the opinion that I was a Young living spy (inferring that I was making this up). Of course this has nothing to do with any affiliation- I would use doTerra if they didn’t do the adulteration with synthetics, but I told her I am 100% correct and have done my research. Synthetic incipients smell good but have no place on my body or in others trying to detox. I’ve actually gotten pretty good at sussing out synthetic essential oil smells, AND they give me a headache! I have some inherited mitochondrial defects, so I suppose I am a canary in the mineshaft of fragrances. Well I am sorry that she was offended, but I have researched this quite thoroughly and I am referring to independent labs that verify this. She asked me to show her the data- so here is some data- I asked her to prove me wrong- and to take this up with her doTerra manufacturers, not merely her “upline” who have a vested interest in cover up. You can view the report for yourself by clicking here: doTERRA Peppermint Analysis. To confirm our Chemist’s comment that ethyl vanillin is a “huge odor,” I overnighted doTERRA’s Peppermint to our Essential Oil Expert and asked his advice. Our Essential Oil Expert comment after an organoleptic assessment (sniff test! ): This essential oil smells very pleasant, but it lacks the “clean” odor of a quality peppermint oil. It is over-sweet and reminiscent of a peppermint and dark chocolate candy. This would be consistent with a low concentration of added ethyl vanillin, a powerful odorant that smells of vanilla/chocolate. Essential Oil Expert comments: Two samples (DoTerra and Heritage) were clearly from the same source. Both samples also contained 0.07% ethyl vanillin, which is a synthetic compound. The fact that many samples were run on the same equipment, but ethyl vanillin only showed up in two oils (which were virtually identical in every other respect as well) suggests that this was not an aberration or contamination that happened during analysis. *******Mar Pollut Bull. 2011 Nov;62(11):2404-11. doi: 10.1016/j.marpolbul.2011.08.029. Epub 2011 Sep 13. Differential presence of anthropogenic compounds dissolved in the marine waters of Puget Sound, WA and Barkley Sound, BC. Keil R1, Salemme K, Forrest B, Neibauer J, Logsdon M.
In ancient Africa, healers used vanilla for stomach problems. The European doctors of the 16th and 17th centuries used it as an antidote for poisoning and stomach complaints, and as an aphrodisiac. It’s important to establish that finding 100 percent pure vanilla oil today is highly unlikely, as it is extremely expensive. Most of the cheap vanilla oils available commercially are either heavily processed or contain loads of synthetic materials, and are unfortunately passed off as the real deal by unscrupulous manufacturers. Unlike other essential oils, vanilla oil cannot be obtained through steam distillation because of its very delicatestructure. Vanilla carbon dioxide (CO₂) – The vanilla pods are put inside a stainless steel chamber that has been injected with CO₂ gas. The air inside the chamber is then pressurized. Under these conditions, CO₂ liquefies and becomes a supercritical fluid that pulls the oil from the pods. In the end, the CO₂ turns back into gas again, leaving the vanilla essential oil. Get whole vanilla pods or beans. Chop them into pieces and remove their seeds. Add them directly to your carrier oil. Although it’s ready to use after a week, letting it sit longer will make your vanilla oil infusion stronger and more effective. It’s okay not to filter out the vanilla pods from the oil if you want, but make sure that it’s completely immersed and it’s kept in an airtight container to prevent oxidation. I had an interesting weekend attending a surgery conference. On the whole it was most enjoyable, but it did raise my awareness that there is still an ignorance about what the term holistic entails. Holistic practitioners embrace a “heal the wholeness” of the individual. There are many therapeutic models that are employed by the Naturopath, some would say this type of para-professional medical team member uses functional pathology, analysis of physical features and dietary/lifestyle/developmental history in a thorough way. Often I am approached by clients and requested to “get to the bottom” of why they are experiencing different signs and symptoms. This means that I require a whole history and also review of their previous test results. (There is no point in spending extra dollars retesting eg. intestinal biopsies, recent blood work etc if they have recently been done!). What I find fascinating is that some GP doctors or even specialists completely discredit the word “Holistic” as they simply have no idea about the meaning of the word. These doctors are simply confused about the terminology. Although I have clients that tell me incredible stories about their, or their relatives healing at the hands of a Homeopathic practitioner, (ie this is a Homeopath- using a diluted water based therapy orally) many doctors assume that the word Holistic equals Homoeopathy=water=nothing in it (equates to quackery in their mind). They then further confuse the word Holistic with Naturopath and rudely disregard an entire profession of Natural healers! I do wonder why these otherwise intelligent people (Doctors, Specialists) have no understanding of the functional pathology and mind-body medicine that Naturopaths practice. It seems that there is a separation of body parts in the minds of the standard western medical paradigm. That is the process by which emotions, and the hormones released by certain thinking processes (anxiety, worry, anger) leading to a cortisol stress response and physical body breakdown, is simply not recognised. Naturopaths like to delve down and get to the bottom of WHY this is happening, correcting the gut biome and changing diet, attitudes, and lifestyle while doing so. It is for this reason that multiple supplements and lifestyle/nutritional changes are recommended. This may take several visits to the Naturopath while the client undergoes paradigm changes and baby steps forward. Its not too different to “going on a diet” and “getting more exercise” which is REALLY what the medical profession should be recommending anyway- instead of drug therapies! In my Animal work I find that many of my veterinary patients reflect lifestyle concerns of the owner- that is the stresses of the home are also impinging on the health of their pet. Diet is also implicated as a factor, or cause of some of the dis-ease. A Holistic practitioner recognises this, and although some Naturopaths also use Homoeopathy, most of us do all the above, and include diet recommendations, some form of body work, exercise, Herbal therapies and macro and micronutrient changes. So please, inform your doctors and let them know that Naturopaths CAN and DO work with the medical profession as allied health care professionals. We ARE covered by most health care funds. That Trying Testing Technical Trap for Thyroid disease! There seems to be an epidemic of Hypothyroidism caused by the autoimmune disease called Hashimoto’s thyroiditis. This is basically where the body turns on itself and starts “eating” its own thyroid. Very often people have not had adequate testing to diagnose this, as thyroid autoantibodies need to be identified. Unexplained weight gain, lethargy, itchy dry skin, tiredness, puffiness, constipation and other GI signs, cold hands and feet, sluggish in the morning, slow heart rate, faint, feeling weak. RT3 (Reverse T3) This is NOT covered by Medicare. It will be a private cost to yourself. Costs range from $50 – $80 upwards dependant on the lab you use. **Vitamin C – check with your own state’s lab of preference. In WA through St John’s Pathology, you are required to attend their Head Lab in Subiaco due to the extra requirements of the testing procedure. If you are on any antidepressants, please check with your doctor if you should be monitored with any extra blood testings involving that. Some meds have leaflets which state requirements of monitoring via blood tests but it’s not always the case your doctor does any monitoring. ALWAYS ask for copies of all your blood tests. Ask your doctor to specifically write “copy to patient” on any and all lab requests. Your doctor’s “normal” result for yourself “may” not always the case. If you need copies of prior tests and your doctor is reluctant to provide them, please contact your lab for instructions on how to obtain your copies. It may mean signing an authority and once ID is provided you can get your copies sent to your home address. The item number for thyroid function test, comprising of TSH, free T4 and free T3 is 66719. Medicare if at least one of the following conditions is satisfied (see MBS schedule below). However if one of the following conditions is NOT satisfied, you can request for private billing. the referral form by the doctor and it is clear you will be paying for the tests. If the doctor writes down TFT then the laboratory may only test the TSH and the free T4. no confusion and the proper tests will be done. Tinnitus: Those bells are ringing! Tinnitus is a condition in which there is “ringing” in the ears. The noise can be intermittent or continuous, and can vary in loudness. Some people hear a hissing or buzzing, rather than ringing. Many causes – almost everything that can go wrong with our ears can produce tinnitus as a symptom! Perhaps as simple as wax against the eardrum, or as serious as a tumour on the hearing nerve. Otosclerosis (fixation of the tiny stirrup bone in the middle ear) can produce tinnitus; so can Meniere’s disease. . Noise destroys! EXPOSURE TO EXCESSIVE NOISE, e.g. chain saws, machinery, rock concerts, IPODs/music earphones. Damage to the middle or inner ear can create an annoying buzzing or ringing sound that can become worse with age and is related to a progressive arthritis or otosclerosis (bones of the ear) Treatment therefore depends on limiting factors that will cause further damage and considering the sorts of treatment you might consider for generalised arthritis, plus increasing blood flow and circulation to the specific affected areas. Hearing aids Good quality and properly fitted- can reduce and even eliminate most tinnitus associated with hearing losses. Hearing aids take away the strain of listening and distract from the tinnitus by bringing you more environmental sounds from the outside world. Therapeutic Noise Generator– if the tinnitus or ringing is constant and annoying this device which looks like a hearing aid and recommended for people with no hearing loss. It produces a blend of external sounds which stimulate most fibres of the hearing nerve helping to deviate attention away from the tinnitus, and may help people adjust to living and studying/reading etc. Go High antioxidant,low carb, High fat (saturated, monounsaturated fatty acids and omega 3 fish and flax oils) protein + EFA oil, multicoloured fresh foods- as many vegetables as you can get into your system. Vitamins A,D, E are fat soluble and need a protein/fat source such as cold water fatty fish 3-5 times a week to help your gut absorb these essential nutrients. B vitamins,meat nuts and seeds.Try green smoothies for breakfast, with Spirulina, chlorella and parsley, plus add trace minerals to your smoothie, particularly chromium and vanadium to balance your insulin levels and prevent a proinflammatory state. Supplement with omega 3 oils 3 capsules 3x/day. Once the condition occurs it is managed by attempting to correct the source- treat and manage infections such as viral causes with Vitamin C, L-lysine, herbal supplements (Echinacea, Elderberry, turmeric, ginger, Golden Seal) and manage stress with Herbs (Withania, ginseng, Rehmannia) yoga, relaxation/meditation, massages, osteopathy, acupressure and acupuncture. 5% of tinnitus is caused by a jaw joint (TMJ) problem as jaw muscles and a muscle in the middle ear are closely connected. When jaw muscles spasm the ear muscles react by pulling the eardrum too tight, and this situation can result in tinnitus. A remedial massage therapist using essential oils of helichrysum, lavender and copaiba may help reduce these taught trigger points. Effective in alleviating distress and producing adaptation to tinnitus. CBT is threefold: changing the way a person perceives tinnitus; teaching ways to focus attention away from tinnitus and achieving control over stress. Offered by clinical psychologists. Eat to Nourish your Nerves! Try to eat a salad a day and a piece of fish such as sardines, salmon or an egg plus flax oil dressing and a couple of handfuls of nuts -walnuts and cashews have adequate vitamin B6 and some oils to replenish your nervous system. What Can Make Tinnitus Worse and how can I help prevent and Treat? 1. Loud noise! – Exposure to sudden or long-term noise can damage your hearing with resultant deafness and tinnitus. High-risk groups include industrial workers, farmers, transport workers – and don’t forget that noisy lawn mower! Reduce the noise source or protect your ears with earplugs, or ear muffs. Leisure noise can also be a hazard, e.g. rock concerts, boom boxes in cars and misuse of a digital iphone/ipods – never play it loudly. 2. Stress and Fatigue – They make tinnitus worse! Keeping busy – trying to focus your energies OUTWARD AND AWAY from the tinnitus – is an excellent idea, but stress and fatigue only undermine your healing. Minimise them by rethinking your lifestyle. Relaxation therapy can help greatly if practised daily. Hypnotherapy from a qualified practitioner may help. Also good – sports, hobbies, yoga, t’ai chi, reflexology or massage. 3. Medications – It is essential to tell your family doctor about your tinnitus; some common medications cause tinnitus as a side effect or make your existing tinnitus worse. Take special care with medications for arthritis, rheumatic diseases, some antibiotics, and anti-depressants. Also aspirin – ask your doctor about alternatives. 4. Try easing off caffeine (tea, coffee, coca-cola, chocolate), and alcohol as they can temporarily worsen tinnitus for some people. Avoid quinine – as in “tonic” water .Avoid Nicotine and marijuana too. Smoking narrows your blood vessels which supply vital oxygen to your ears and their sensory cells. PLEASE – quit smoking! 5. Take supplements: Gingko biloba, Gotu kola essential anti-inflammatory omega 3 fatty acids (DHA, EPA) Quercetin, Vitamin A,D,C,E, B’s Zinc, Magnesium, Selenium and a diet high in antioxidants (berries, green leafy veges) will help reduce stress and repair your body. Check with your Doctor for doses if on warfarin. 6. Eat a well balanced diet, get adequate exercise 20min/day- maintain a healthy weight; being obese results in an proinflammatory state. Exercise helps to lubricate your body and allows the nutrients to get through to your cells. Reducing atherosclerosis and plaque build up with good nutrition and exercise will keep the circulation to your nervous system active and healthy. 7. Keep your Ears/head and neck warm! If your circulation to your ears is reduced with your body’s attempt to stay warm, the tinnitus can get more pronounced. Chai tea for Ear health: in a large pot 5 cups of water and 5 tbsp of Dandelion tea/coffee and brew with 2 tbs each of coconut milk, coconut oil, 3 cm of Rehmannia glutinosa root (from chinese supermarket) pinch of turmeric, cardamom pods, anise, ginger, cinnamon and nutmeg, plus 2 drops of stevia or honey to taste, blend in 1 tsp of flax oil prior to serving . 8. Get regular soothing, gentle neck and shoulder massages this will keep the blood circulating efficiently through your auditory nervous system, oxygenate and cleanse and prevent toxin build up.